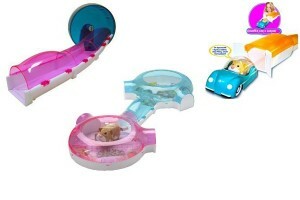 Home » Zhu Zhu Pets: Without The Mess!! As the mother of a child with special needs, finding fun things to do with my son can be challenging and sometimes keeping him entertained, even more difficult. Because he is not able to use his hands as he would like, playing on his own is just not always possible. One thing is for sure, Ashton loves animals and although we have a dog and a cat here in our household, they are often not as interested in him as he is in them. I have found a great idea for parents who would like to give your child their own hamster minus the mess, smell or unexpected deaths! They are called Zhu Zhu Pets and these electronic hamsters have been named one of this year’s hottest toys for the holiday season by Time to Play. These little guys all come with their own unique personality and make 40 different sounds if you can believe it. In ‘loving’ mode, you can pet them, love them and hear them chatter. In explore mode, they can scoot and scamper across the floor. Additionally, there are a ton of accessories you can to purchase for these fuzzy creatures, including the typical hamster wheel, a car, a surf board or even a skateboard! Just connect whatever pieces you would like, turn the hamster on and this little creature takes on a life of its own. Check out these cute little life like animals HERE. 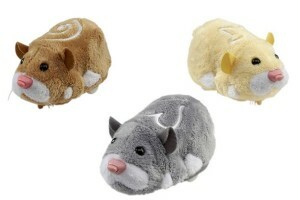 We now have 3 Zhu Zhu pets and they are adorable, just like having the real thing without the cleanup!!! Looking forward to purchasing the other items to make them a home of their own. My daughter is 8 and just loves them. I like picking them up and holding them, they are so soft.